It was a hot day on August 23, 2015 when Rhoda Grossnick, a resident of Janesville, brought a young bird to the Hoo’s Woods Raptor Center (HWRC). In my 18 years as the Center’s Director, I’d never seen this type of bird before. 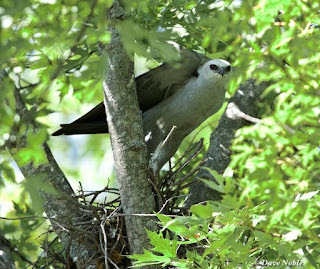 After posting a photo on Facebook, several biologists in southern states quickly identified the mystery bird as an immature Mississippi Kite (Ictinia mississippiensis). The bird was just learning to fly and appeared to be about six weeks old. It was critically low in body weight and needed food. Worse yet was that its vision was impaired, a symptom of West Nile Virus. 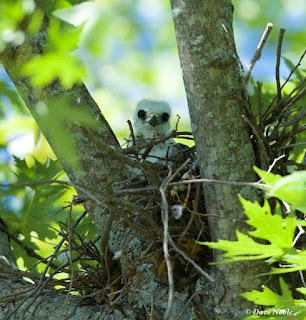 I contacted the Wisconsin Department of Natural Resources (DNR) and, to our knowledge, this was first Mississippi Kite ever recovered in Wisconsin. We weren’t sure where it came from but, judging by his age and condition, I was certain it had not traveled far. In time, we named it “Wrong Way.” The bird is not releasable due to both its restricted vision and the abnormal molting of its tail feathers. With permission from the U.S. Fish and Wildlife Service, it remains with us as an education ambassador. I was not totally surprised when, in late July of 2016, I received a call from Dr. Jane Anderson. She stated that an adult pair of Mississippi Kites was seen in the same vicinity where Wrong Way had been found last year. Dr. Anderson saw Wrong Way at one of our education programs and was able to identify other members of its species. Immediately, I drove to check out the sighting and sure enough, there were two adult kites sitting about 300 feet apart, each in a snag at the top of a dead tree. I reported the sighting to the Wisconsin DNR state ornithologist Ryan Brady. 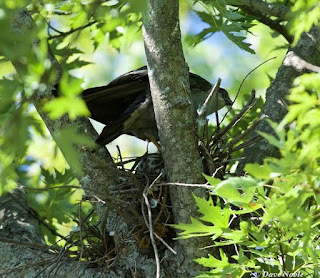 Several days later, DNR staff were able to locate a nest containing one feathered chick. The tiny stick nest sits high in a tree in a residential neighborhood. While investigating this siting, I spoke with a landowner who said her nine-year-old son, told her that a “Bald Eagle” was nesting in their front yard. He assumed this because the chick had a white head. This was long before any of us realized the kites were here. She told her son they were some type of hawk but didn’t think anything was unusual about them. It’s a sure bet that most folks in the Great Lakes region wouldn’t recognize this species. This is the first active Mississippi Kite nest to be documented in Wisconsin. However, it seems logical that Wrong Way could have been produced at this same location, possibly from the same pair of adults, in 2015. All parties agreed not to disclose the exact location in order to avoid unwanted human disturbance to both kites and the nearby residents. Kites are relatively small, similar in size to a pigeon, and a member of the hawk family. Their diet consists mainly of dragonflies, an occasional small bird, and other insects. They are known to transfer food from their feet to their beaks in flight. In recent years kites have been expanding their range in the U.S. nesting as far north as New Hampshire, Illinois and Canada. This is an exciting development on two fronts. First, is that the Mississippi Kite has finally been confirmed as a breeding species in Wisconsin. And second, is that wildlife outreach programs, conducted by organizations like Hoo’s Woods Raptor Center, can be shown to have a positive impact on raising the public’s awareness and knowledge about Wisconsin’s rich wildlife resources. The Hoo’s Woods Raptor Center is proud to have played a small part in this historical event. Attend one of our education programs and see for yourself that education can make a difference.